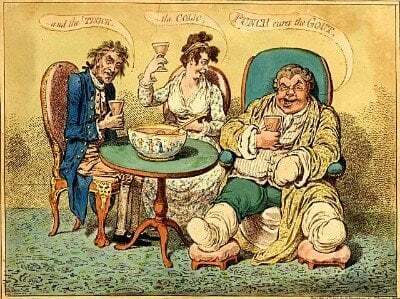 Surprising allopurinol news – it’s OK to start today even if you have an active gout flare. Let me explain the new study into starting allopurinol, then you can see how it applies to you. For a long time, rheumatologists have recommended against starting allopurinol if you have are experiencing a gout flare. They fear that allopurinol will make the flare worse, so it is better to wait until it has subsided before starting allopurinol. This has always puzzled me. I know from years of gout pain experience, that gout pain can be controlled with the right pain relief combination. Given that, I have never understood why there should be a delay. New research agrees with me. In Initiation of allopurinol at first medical contact for acute attacks of gout: a randomized clinical trial, published in November 2012 American Journal of Medicine (Am J Med), Taylor and colleagues seek clarification of when to start allopurinol. My layman’s summary of the report abstract follows. The authors proposed that early or delayed starting allopurinol makes no difference to gout pain or further acute gout attacks. They believe that simplifying the start of allopurinol treatment could save cost and avoid the belief that treatment is not required once pain has gone. The study started with a 10 day initiation phase followed by conventional allopurinol treatment. 57 men with confirmed gout were randomly divided into allopurinol and placebo groups. 300mg allopurinol or placebo was taken for 10 days, with 50mg indomethacin three times per day and 0.6mg colchicine twice a day. 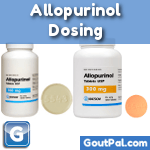 All gout patients continued with allopurinol from day 11, with colchicine for a further 80 days. Joint pain was measured during the first 10 days, and self-reported gout flares were recorded for the first 30 days. Pain scores reduced dramatically in both allopurinol and placebo groups during the first 10 days, with neither group experiencing more daily pain. Gout flares occurred in 2 allopurinol patients, and 3 placebo – i.e. no significant difference. Uric acid decreased from 7.8mg/dL to 5.9mg/dL in the allopurinol group after 3 days, but sedimentation rates and C-reactive protein levels stayed the same in both groups. The authors conclude that starting allopurinol during an acute gout attack makes no difference to daily pain, recurrent flares, or inflammatory markers. My only complaint against this study is that patients were started on 300mg instead of 100mg with appropriate allopurinol dose increases to reach 5mg/dL uric acid. As explained in my allopurinol reference pages, this will minimize allopurinol side effects. I’m sure you will insist that your doctor starts allopurinol dosing at 100mg, or appropriate lower dose if kidney function is impaired. I hope you will insist on an immediate start to allopurinol, with colchicine and appropriate NSAIDs to give you a pain-free way to lower uric acid. The trial seems to have been well-done, and based on the findings it seems safe to start allopurinol during an acute attack,provided effective anti-inflammatory therapy has already been started. However, just because a therapy may be safe doesn’t mean that it should always be introduced. He continues with an explanation of 5 important steps to be considered before allopurinol is started, irrespective of the state of your gout flares. We are discussing these in the gout forum, so follow the link below to see the personal gout facts that are important when you start allopurinol. If you are concerned about starting allopurinol, you should discuss this with your doctor. However, you might be unsure what to ask, or not understand your doctor’s responses. If so, you can discuss starting allopurinol in the gout forum. If you want to read more facts about allopurinol dosing, you will find them in the allopurinol guidelines.